NC State students and twins Olivia (left) and Vanessa Merritt are working to make campus more bird-friendly. 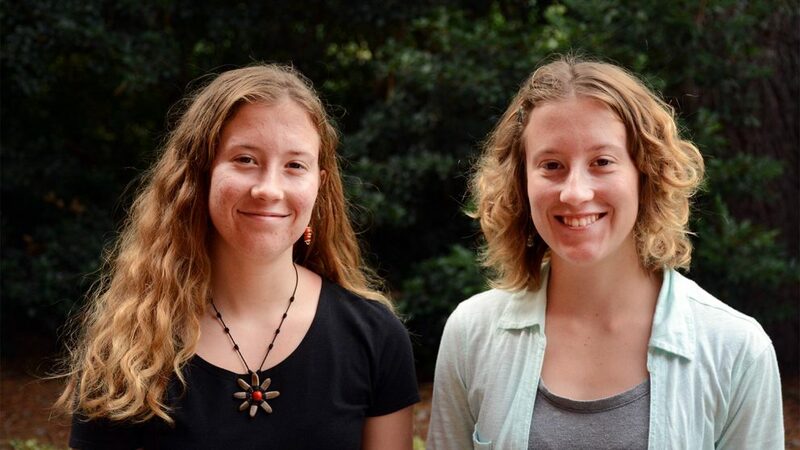 Twins Olivia and Vanessa Merritt hadn’t yet started their first year as NC State students when they began leading a sustainability-related project that could protect birds flying through campus. 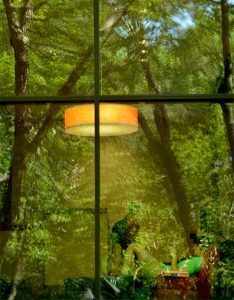 Reflections of trees and other vegetation in windows are a leading cause of bird collisions with windows. Both long-time bird enthusiasts, Olivia and Vanessa are collecting campus data on bird collisions with buildings, which is estimated by the American Bird Conservancy to kill up to 1 billion birds annually in the United States. “This is the second-leading cause of bird deaths,” Vanessa said. That’s problematic because birds help control pests, pollinate plants, disperse seeds and reduce disease outbreaks. According to the Cornell University Lab of Ornithology, birds collide primarily with windows, which reflect trees and other vegetation. In Raleigh, these collisions are even more likely during the fall and spring since the Triangle area is in the Atlantic Flyway migration route. Inspired by a similar study at nearby Duke University, Olivia and Vanessa set out to explore the prevalence of bird collisions at NC State and whether window modifications might help birds more safely navigate campus. By their first day of classes, Olivia and Vanessa had worked with six university and community organizations to organize a campus data collection effort during fall migration season. NC State’s Sustainability Office, Grounds Services and Office of the University Architect along with NC Sea Grant, Wildlife Resources Commission and NC Museum of Natural Sciences offered resources, expertise or insight for the study. The sisters also recruited College of Natural Resources students to help with building surveys, which were conducted every weekday afternoon from mid-September to mid-October. 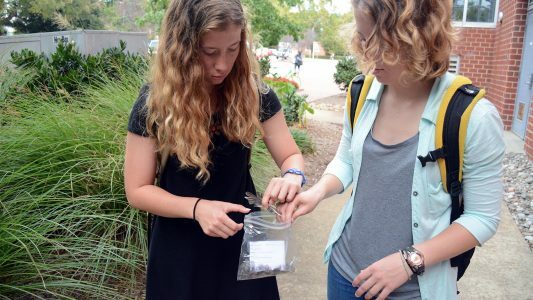 Olivia (left) and Vanessa Merritt collect feathers found outside Student Health Center, one of the campus buildings in their study. When feathers are found next to a building, it can indicate a bird collision occurred with the building but the birds’ remains were scavenged. Based on reports of previous bird collisions, Grounds Services helped Olivia and Vanessa narrow the surveys to 9 buildings on campus: Bragaw Hall, Talley Student Union, Student Health Center, Jordan Hall Addition, Alliance Building, Hunt Library and its green roof, Toxicology Building and the Wildlife Resources Commission. During daily surveys, student volunteers and Grounds Services employees examined a close perimeter of these buildings, where they looked for evidence of bird collisions. “Usually within 24 hours [of the collision], there’s no sign of the bird,” Olivia said. That’s why surveyors looked for bird fatalities and piles of feathers, which indicate a collision occurred but the bird had already been removed by a predator. By the conclusion of the 30-day collection period, surveyors had documented 26 bird collisions. During the upcoming spring 2018 migration season Olivia and Vanessa hope to repeat the study ‒ perhaps expanding to include weekends and utilizing an app that would allow the campus community to report bird collisions. Olivia and Vanessa say these data collection efforts are just the beginning. They are exploring the feasibility and effectiveness of a number of commercially-available solutions, such as UV window film and patterned window decals, that would make glass more visible to birds in flight. Though campus birds could be the latest to benefit from the sisters’ Think and Do spirit, Olivia and Vanessa have focused on protecting natural resources since middle school when they read a book about birds. As teens they joined the local Young Naturalists Club and even deferred admission to NC State for a year so that they could participate in service projects and bird-related studies in Spain, Nicaragua and western North Carolina. Both are majoring in Fisheries, Wildlife and Conservation Biology but with different career goals. Olivia, who is a Goodnight Scholar, hopes to work in conservation management while Vanessa aims to help address human and environmental challenges. “We care about natural resources and how we use them,” Olivia said.